India Inc.'s generous serving of dividends, despite dismal earnings growth, feeds its own needs. Dividend payout is a crucial indicator for investors while selecting stocks. A company with a regular dividend payment history shows it is making profits. 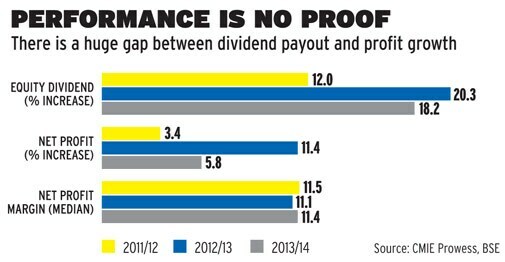 If the company decides to pay higher dividend, it should mean that profits have also increased. But, recent data show otherwise. India Inc. has been very kind in distributing profits to their investors, but there is huge inconsistency between their profit and dividend payout growth. Equity dividend payout of BSE 500 companies between 2009/10 and 2013/14 rose at 15.3 per cent compound annual growth rate (CAGR), while their net profit increased by only 8.2 per cent CAGR. Sample this: Out of the 715 companies that have released their annual reports for 2014/15, dividend payout witnessed a 19 per cent growth, while net profits was just at 4 per cent. Around 18 per cent of these companies have increased their dividends payout ratio in 2014/15 despite witnessing a negative growth in their bottom-line. 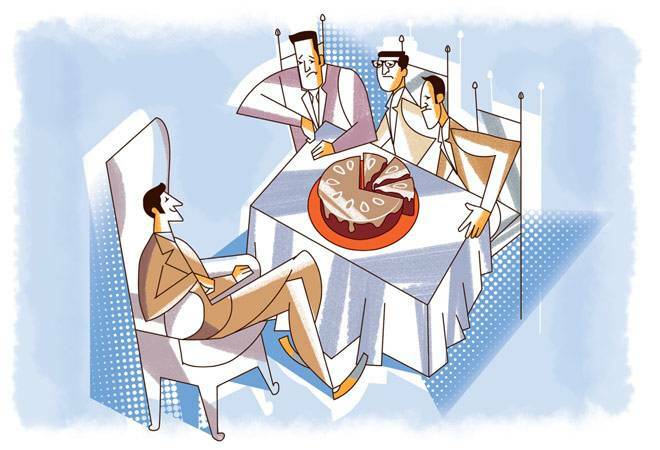 This puts a big question mark on the policies of corporate India and the rationale behind increasing dividends. "One of the major reasons behind rising dividend payouts is weak business sentiment and lack of investible opportunities. So, companies, which are sitting on cash, have preferred to distribute the surplus," says Amit Tandon, Managing Director, Institutional Investor Advisory Services (IiAS). The bulk of growth in dividend payouts in 2014/15 came from TCS, Infosys, Bharti Infratel and Wipro. TCS paid Rs 15,474 crore to shareholders, two-and-half times more than last fiscal. A special dividend of Rs 40 per share to celebrate its tenth year of stock market listing, made the difference. Wipro's and Bharti Infratel's dividend payout were up 50 per cent and 150 per cent, respectively. Apart from Bharti Infratel, whose bottom-line grew 31 per cent in 2014/15, all others showed marginal growth in profits. TCS, which emerged as India's highest dividend payer in 2014/15 even with its net profit growing just 4 per cent year-on-year, also surpassed Coal India, the highest dividend payer traditionally. Dividend announcements also have an impact on stock prices - a major factor behind the stock market performing well, regardless of the poor corporate results. As on August 6, the Sensex gained 5,728 points, up 25.6 per cent from its March 2014 levels. Dividends paid add up to the shareholders' return, over and above the capital gains they earn through share price movements. "Dividend payout is a distribution of value to investors unlike earnings growth, profitability and cash flows, which are considered to be value creators. Investors attach more importance to value creation in their investment decisions. That said, dividend payout does act as a cushion to valuations and profitable companies, which generate free cash flow from operations (FCFO) and pay dividends, are considered good investment bets. However, low ROCE, high dividend companies with negative FCFO and leverage may not necessarily be good bets," said Ravi Sundar Muthukrishnan, Co-Head Research, ICICI Securities. Dividend income, however, does not add much to the profits of small investors. But, promoters and large investors make considerable wealth from the bounty. Interestingly, all major dividend payers herein, are promoter-led companies. Tata Sons, the promoter of TCS, owns 73.7 per cent shares and has earned around Rs 11,400 crore through dividends. Most of this money will be reinvested in other Tata Group companies, such as Tata Steel, which are struggling to get back on track. Another major contributor to the spurt in India Inc's dividend payouts is public sector units and the reason is evident: As the government of India is a majority shareholder, it is directly benefitting from liberal dividend payouts by PSUs. "The fiscal deficit pressure has resulted in PSUs steadily increasing dividends and this is reflected in the increase in aggregate dividend payouts of India Inc," says Tandon. Coal India paid dividends of Rs 13,075 crore in 2014/15, followed by Rs 8,128 crore by ONGC. Both companies had reported a dip in profits last fiscal. While the regulations in India do not mandate companies to state a clear dividend policy, the disconnect between dividend payout and profit builds a strong case for a transparent mechanism in declaring dividends. "The regulator must encourage companies to declare a clear dividend policy in the company's annual filings. Companies must also spell out the minimum dividend they will pay as a percentage of its earnings, and this should also be placed before the shareholders' for ratification," adds Tandon.